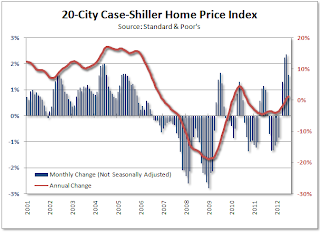 All signs continue to point to a recovery in the U.S. residential real estate market The summer 20-City Case Shiller Home Price Index shows that property prices increased in June and July. Standard & Poor’s reported that the adjusted numbers were not as impressive, but they were still positive. All 20 cities, which included hard-hit towns like Atlanta and Las Vegas, all showed average gains throughout the summer. The news is dampened somewhat due to the fact that banks are still keeping many distressed homes off the market to juice prices, but experts believe that sales and prices will continue to rise through 2012. For more on this continue reading the following article from Iacono Research. 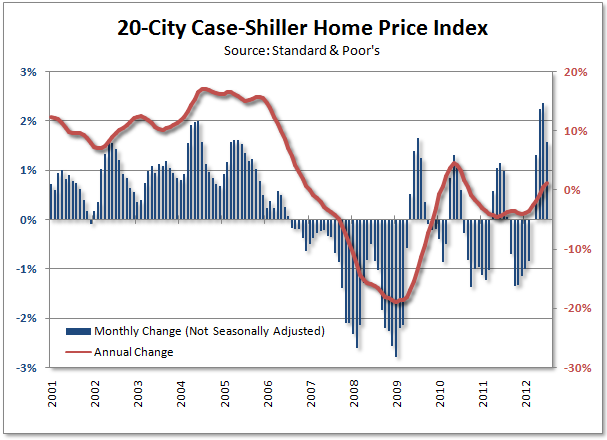 The nation’s housing market continued to rebound over the summer as Standard & Poor’s reported(.pdf) that the Case-Shiller 20-City Home Price Index rose 1.6 percent in July following a surge of 2.3 percent in June. The most respected measure of U.S. home prices now indicates a gain of 1.2 percent from a year ago. On a seasonally adjusted basis, prices rose for the sixth straight month with the July gain at a less impressive 0.4 percent, after an increase of 0.9 percent the month prior, however, there is no mistaking the fact that home values are rising steadily this year after languishing for nearly two years following the initial rebound from the 2008 financial crisis and the myriad of home buyer incentives from the U.S. government. All 20 cities showed gains in July, paced by surges of 3.7 percent in Minneapolis and 3.3 percent in Detroit. Even Atlanta home prices are on a tear as June’s 4.4 percent jump was followed by a 2.6 percent advance in July. On a year-over-year basis, Atlanta is still the clear laggard at -9.9 percent, along with Chicago, Las Vegas, and New York one of only four cities where prices are lower than a year ago and one-time housing basket case Phoenix leads all cities with home price gains of 16.6 percent over last year. Of course, recent gains are due in part to limited housing inventory as banks continue to hold distressed properties off the market and move slowly on new foreclosures at the same time that mortgage rates have become freakishly low, setting new records just about every day in the wake of the Federal Reserve’s latest money printing extravaganza in which they’ll buy $40+ billion in mortgage backed securities each month. Don’t you just love it when a good asset re-flation plan comes together?